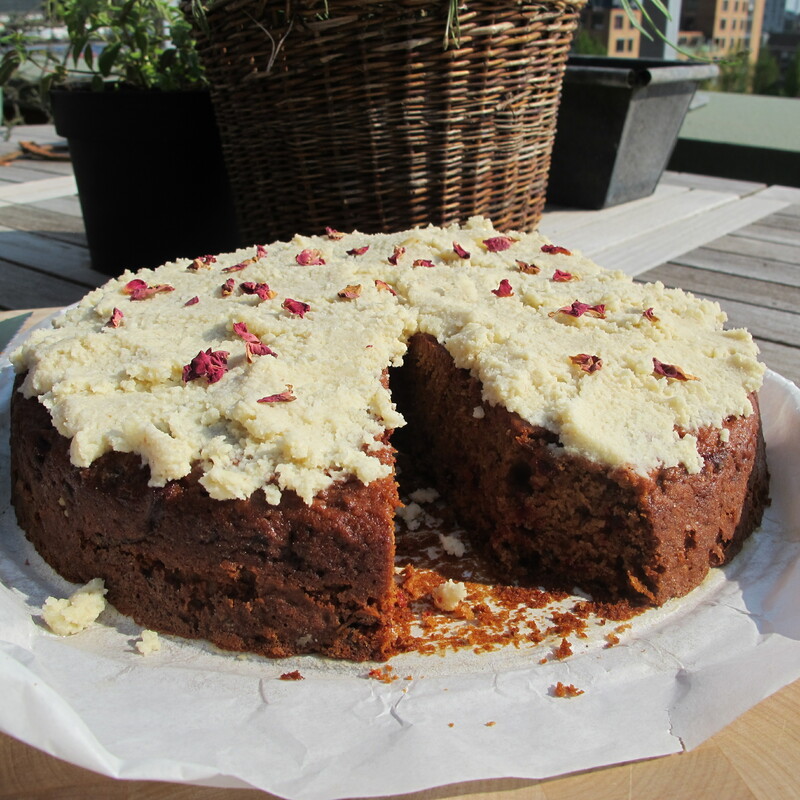 A beetroot cake, designed to fit a vegan diet without having to compromise on taste or structure. Mix the flaxseeds with 9tbsp of water, let it soak for 10 minutes. Add 1/2cup of almond milk and puree it into a glue like consistency. Grease and dust a spring form. Mix the flaxseeds with the oil, syrup, beetroot and lemon. Mix the baking powder and soda with the flour, then add this to the liquid mixture. Stir just long enough to combine, don’t over mix. Pour the cake mixture in the spring form and bake for 1 hour in the oven. Test with a skewer if the cake is ready, if there are still crumbs on the skewer when you take it out, give it some more time. Put the almonds in a tight bowl and cover with almond milk. If you soak it for an hour you’ll have a more crumbly texture. Soak it longer and it will become creamier. Puree the almonds and flavor with rose water and honey to taste. My mother in law found this recipe in an Israeli newspaper. We exchanged the sugar for date syrup and came up with our own topping. 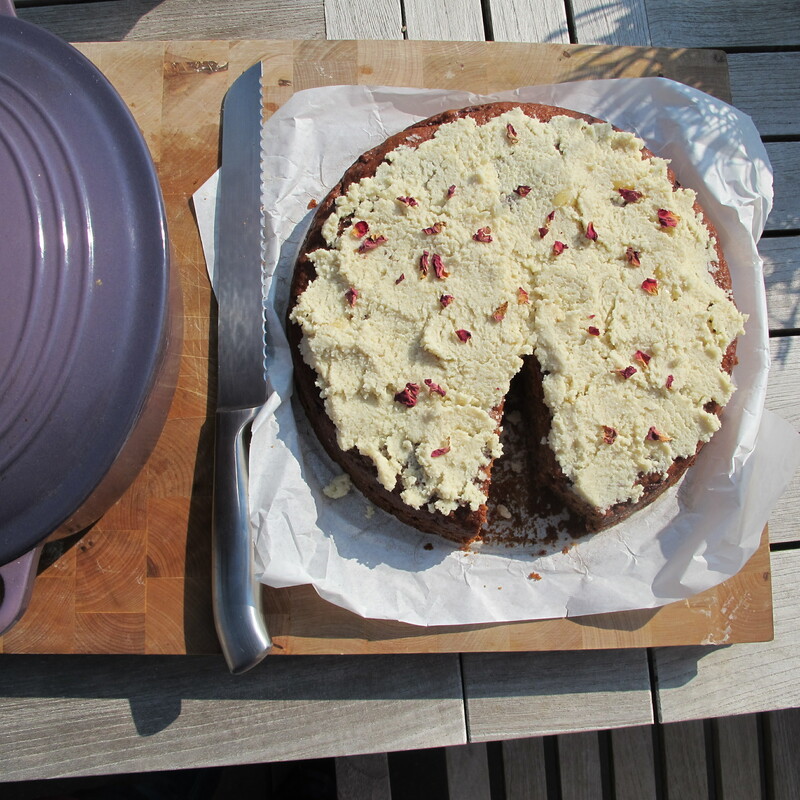 Een veganistische cake waarbij je niet in hoeft te leveren op smaak en textuur. Mix de lijnzaad met 9 eetlepels water. Laat het 10 minuten weken en pureer het dan met de amandelmelk tot een lijmachtig geheel. Mix het lijnzaad mengsel met de olie, siroop, bietjes en de citroen. Mix de bakpoeder en baksoda met het meel en de bloem en mix dit alles door het vloeibare mengsel. Mix net lang genoeg tot het samenkomt. Stort het cakemengsel in de springvorm en bak ongeveer een uur in de oven. Als er na een uur nog kruimels aan je prikker zitten, geef hem dan nog wat extra tijd. Week de amandelen in de amandelmelk. Als je ze na een uur pureert krijg je een iets korrelig resultaat, als je ze langer laat weken dan wordt het mengsel zachter. Zoet met honing en rozenwater naar smaak. Mijn schoonmoeder vond dit recept in een Israelische krant. We hebben de suiker vervangen door dadelsiroop en onze eigen topping bedacht. 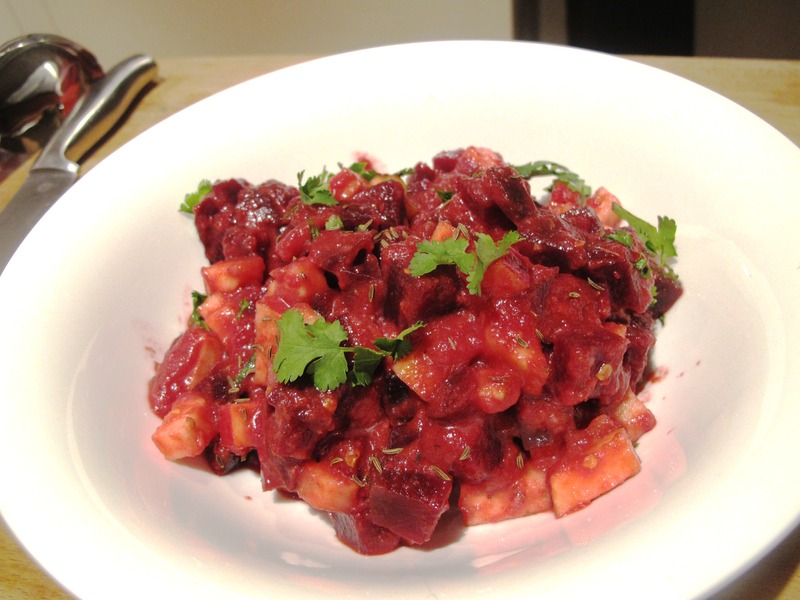 Roasted beets have a wonderful sweet and earthy flavor; but if you end up with a pair of cooked beets of which most of the flavor is flushed away with the cooking water, there is still hope. 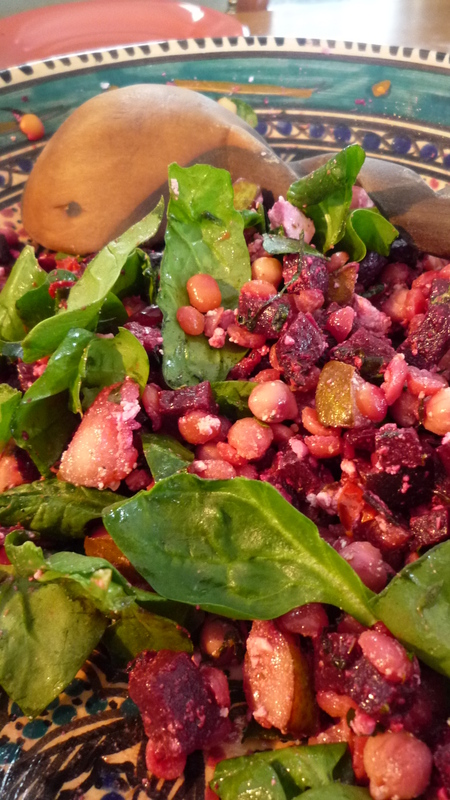 Naturally roasted beets have my preference but I managed to make a very tasty salad with the cooked version as well. You can also change the peas for lentils but the peas do give a nice bite to the salad. Cook the yellow peas with the bay leaf and one chopped garlic clove until soft but not mushy. Cut the onion and tomatoes in parts and slice 3 garlic cloves. Heat a layer of oil in a big skillet and slowly bake the onion, tomato and garlic on a low fire for about 10 minutes. Cut the beetroot in little cubes and add them to the onion. Mix it well, add the balsamico vinegar, thyme and the honey, generous pepper and salt and turn the fire a little higher. To make the dressing. Mix the yogurt with a crushed garlic clove, sumac, cider vinegar, mint, honey pepper and salt. When the beet is warm and caramelized, mix it with the peas, crumble the fettah and add the spinach and the pear. Serve the salad with a dot of the yogurt dressing on top.